The Son Gual Ridingschool is situated in the municipality of Palma de Mallorca, in the province of Baleares. 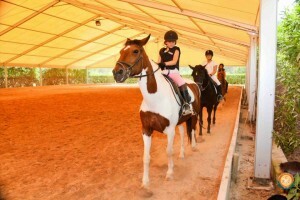 Our installations comply with all legal standards required by the administration for equestrian centers dedicated to educational riding, leisure riding and livery. Since its inauguration it is one of the most emblematic and renowned riding centers of the Balearic Islands.Our intention is to offer our students a wide range of services related to the world of horseriding, with a high value based on our individualized service, our high quality installations and our offer of the best horses. Transformation of organic material to compost (Therapeutic horseriding, Hippotherapy (as a complementary extra scholar activity). A space where children with any sort of handicap can better their physical and sensory abilities, as well as their social integration, through the contact and care of horses. 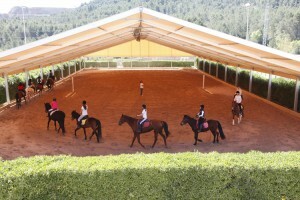 The Son Gual Riding center S.L is an ample multi-facility space dedicated to equestrian sports. Most of the activities offered take place at the Son Gual Riding school, located in Palma de Mallorca, Baleares.